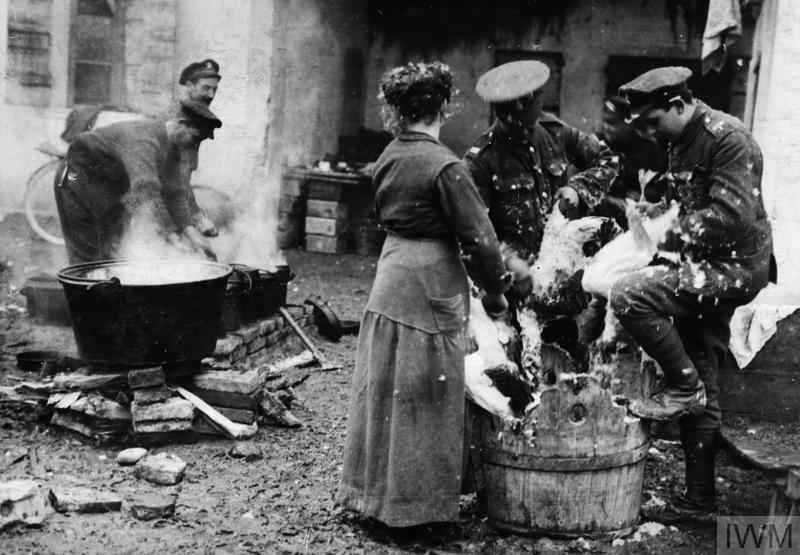 By 1918, the British were sending over 67 million lbs (30 million kg) of meat to the Western Front each month. Daily rations were meant to include fresh or frozen meat, but many meals would have consisted of tinned food, like this ‘Maconochie’ beef and vegetable stew. Named after the company that made it, it was a familiar aspect of the British soldier’s diet. 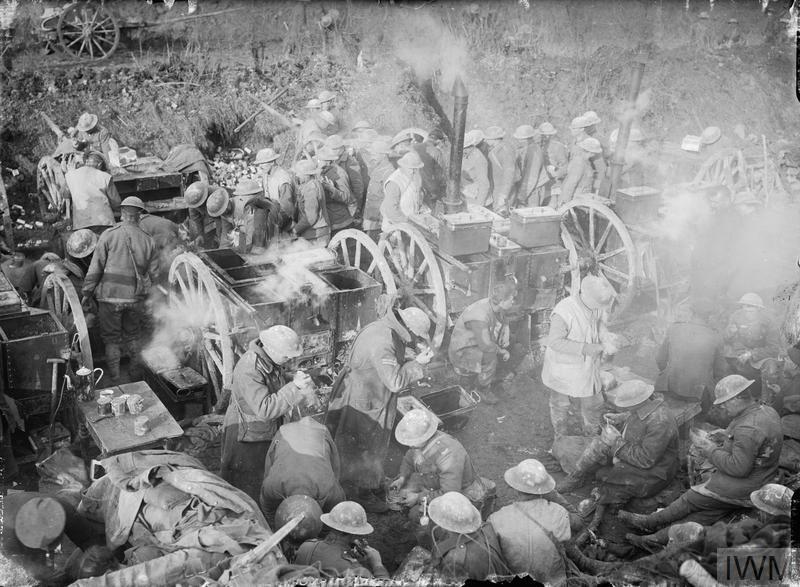 British troops receive dinner rations from field kitchens in the Ancre area of the Somme, October 1916. 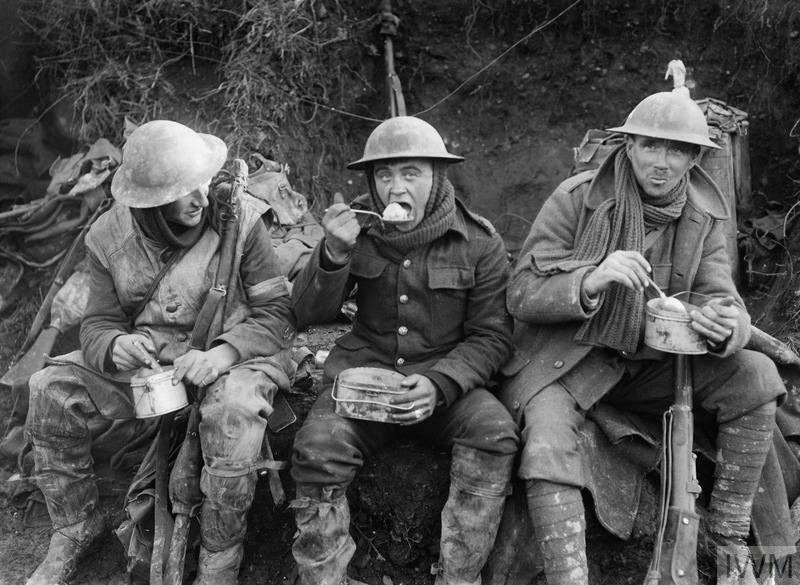 British soldiers eat hot rations in the Ancre Valley during the Battle of the Somme, October 1916. The British soldier's daily rum ration could boost morale and help some men cope with the stress of battle. Rum jars, like this one, were marked with the initials 'S.R.D.' The letters probably stood for 'Supply Reserve Depot', but soldiers joked that they meant 'Soon Runs Dry', 'Service Rum Diluted' or 'Seldom Reaches Destination'. 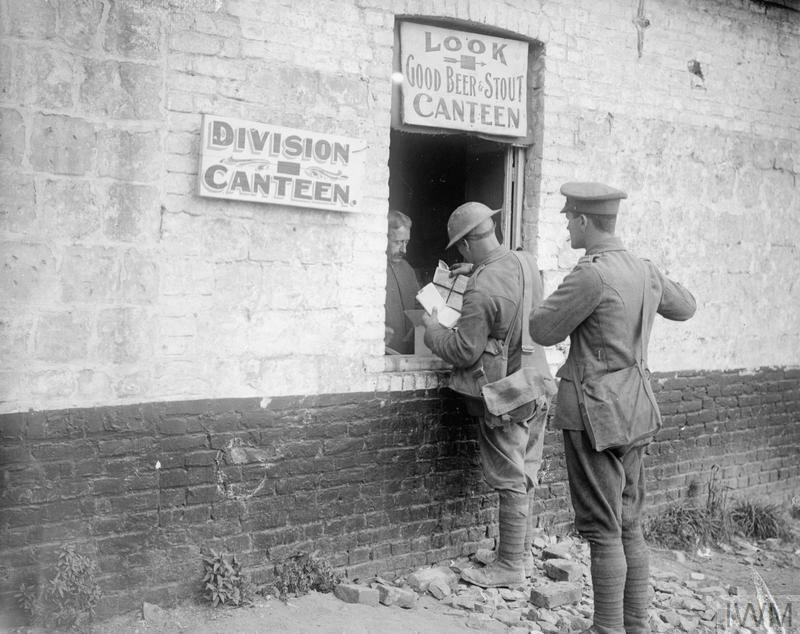 Troops at a canteen that sells beer and stout in Zillebeke, Belgium, 24 September 1917. An Italian woman helps British troops pluck turkeys for their Christmas dinner in 1917. 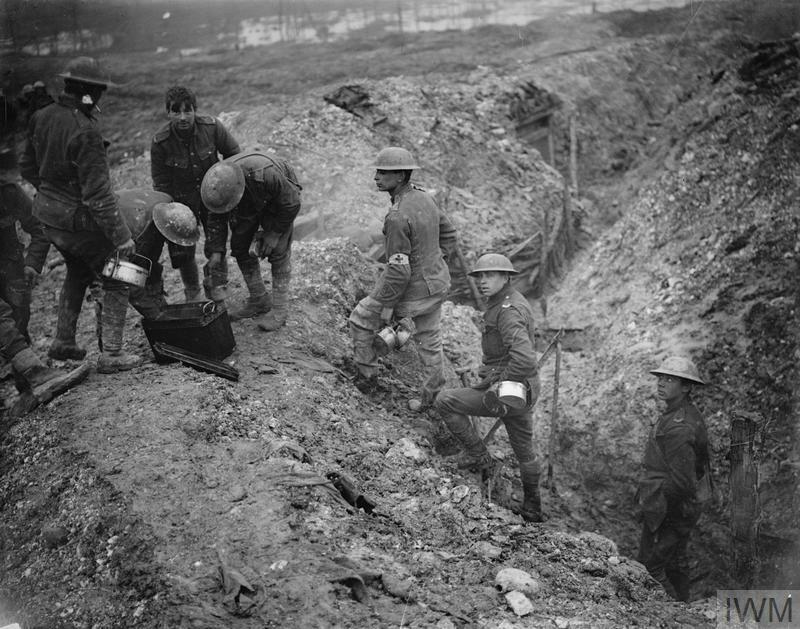 Stew is served at the edge of a reserve trench near St Pierre Divion on the Somme, November 1916. 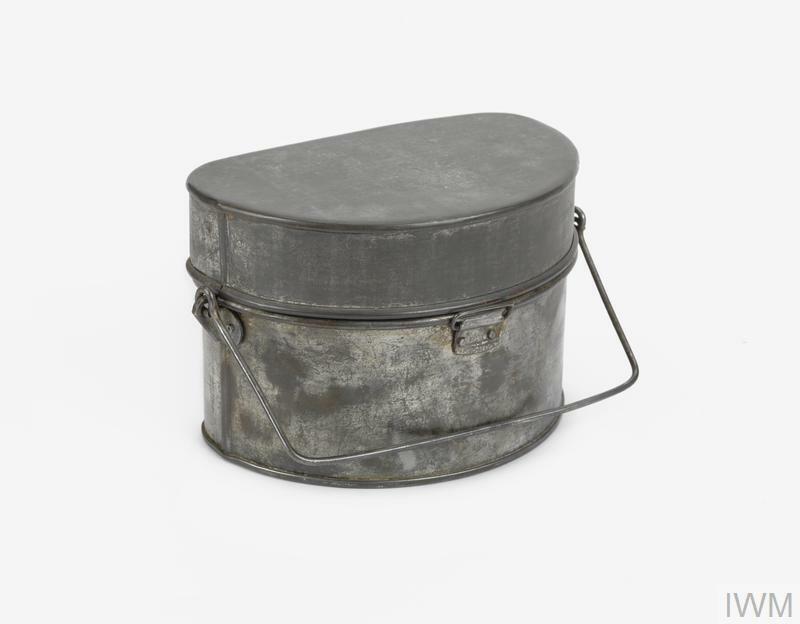 Food containers, like this one issued by the German Army, were used to carry hot food to soldiers in the trenches. 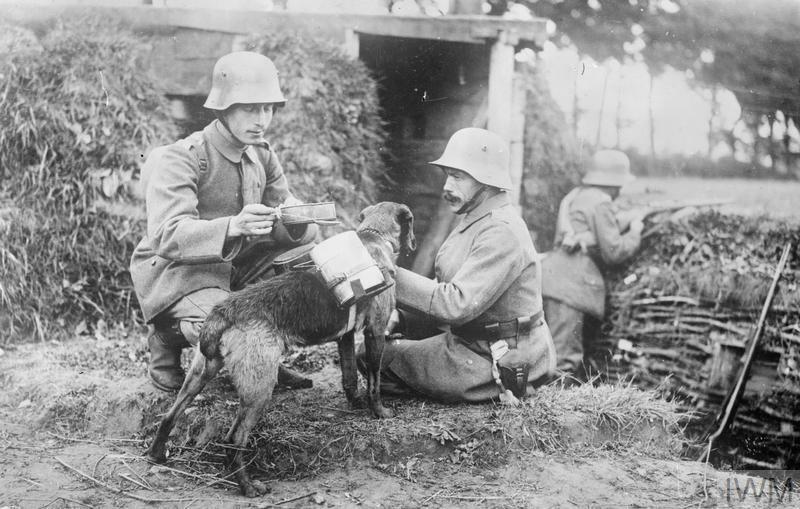 A despatch dog brings food to two German soldiers in an advanced trench on the Western Front. The dog is wearing a special harness on its back to hold mess tins. 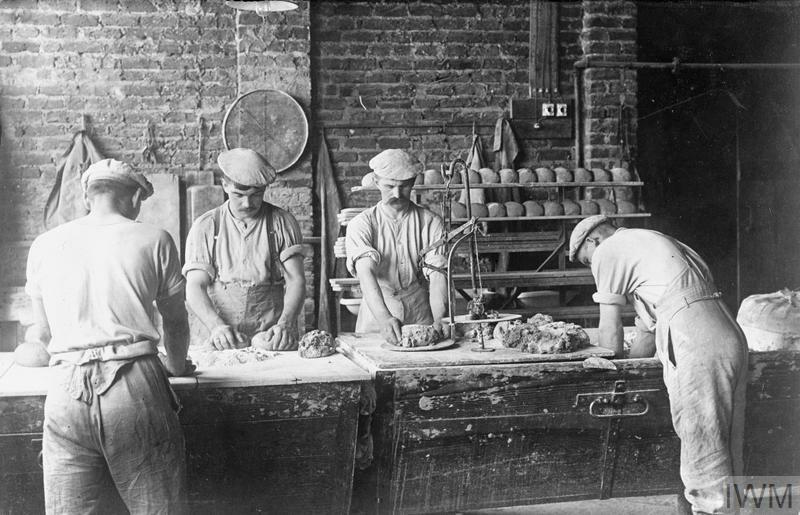 Bread is made in a German Army field bakery at Wervicq in Flanders, 1916. This British Army issue biscuit was a key component of a soldier's rations. The biscuits were produced under government contract by Huntley & Palmers, which in 1914 was the world's largest biscuit manufacturer. The notoriously hard biscuits could crack teeth if not first soaked in tea or water. Tea was also part of the British soldier's rations. It was a familiar comfort and concealed the taste of water, which was often transported to the front line in petrol tins. 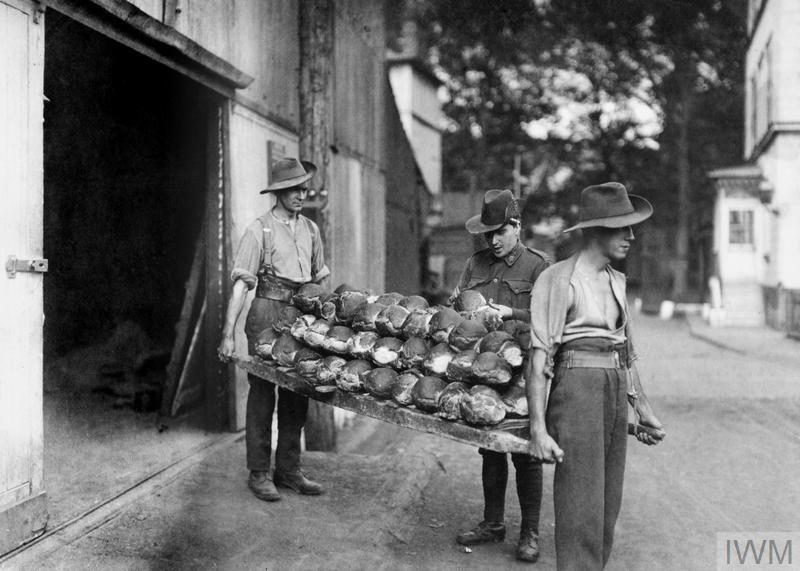 An Australian NCO checks a batch of bread before it is transferred to the bread store at an Australian Field Bakery in Rouen, France, September 1918. 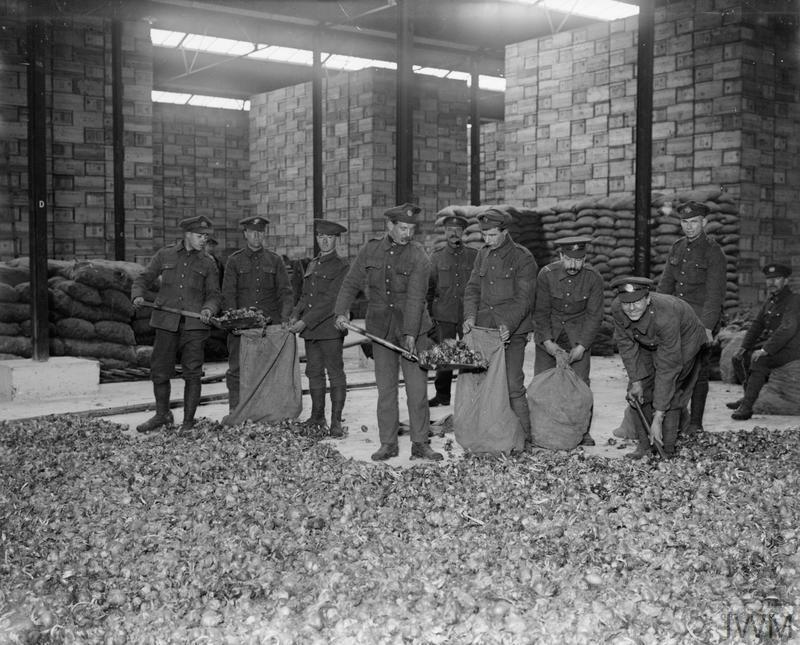 Men shovel onions into sacks in a store house in Calais, March 1917. Soldiers on and behind the front line ate their meals out of a British Army issue mess tin. It was an essential part of every soldier's kit. 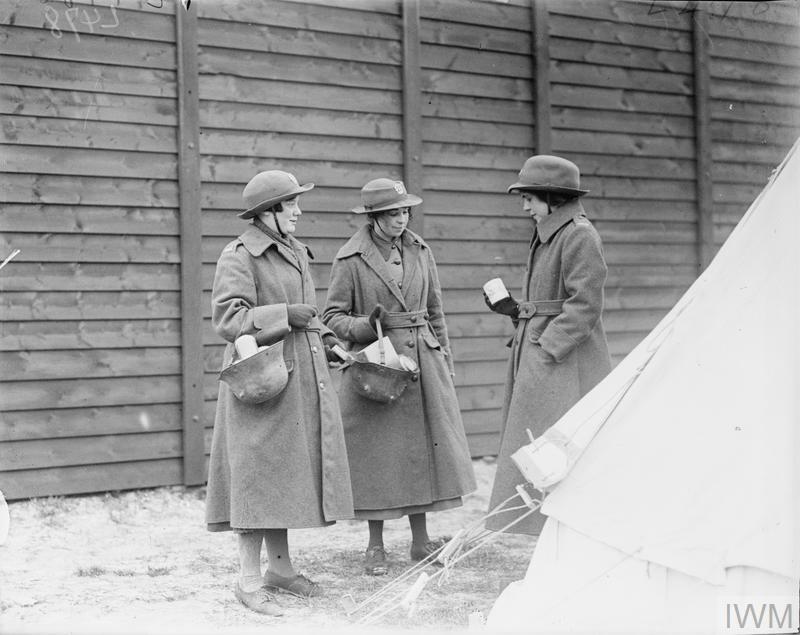 Servicewomen from the Women's Army Auxiliary Corps (WAAC) carry their tinned rations in German helmets at Etaples, 26 April 1918. 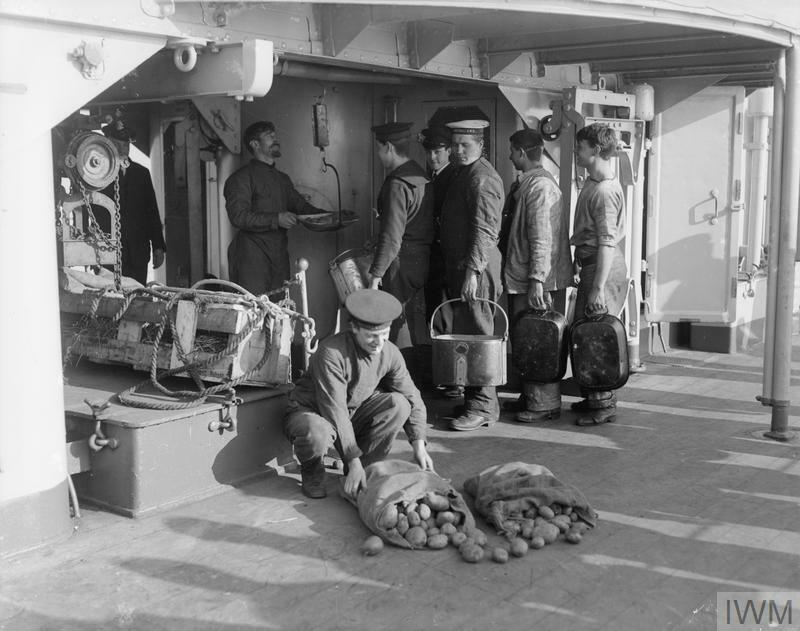 Potato rations are issued on board a British Light Cruiser. 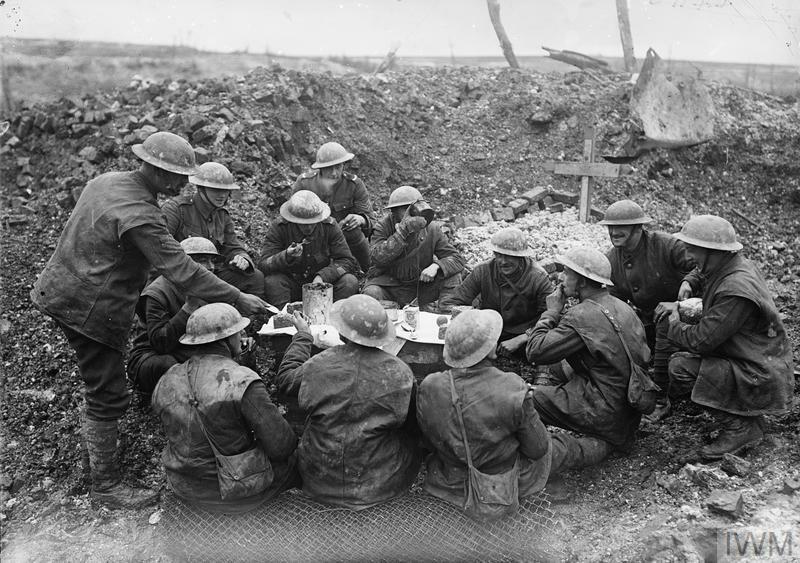 British troops eat their Christmas dinner in a shell hole at Beaumont Hamel on the Somme, 1916. 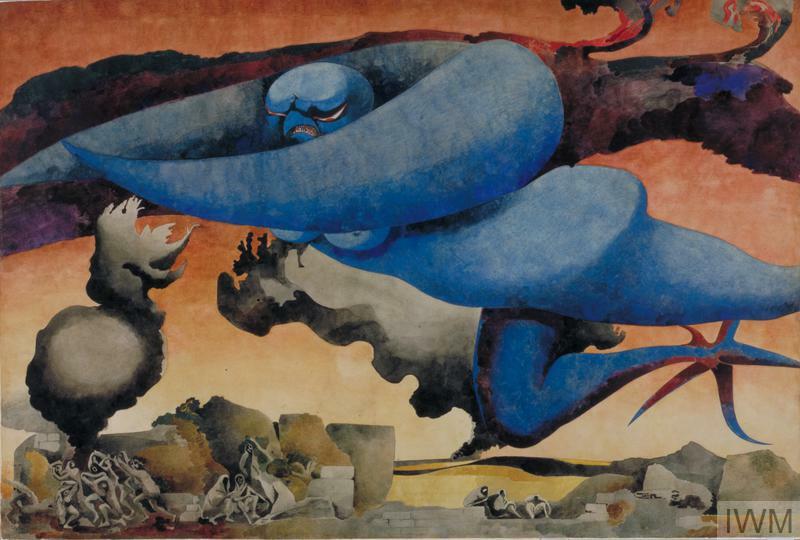 Hunger stalked the civilian populations of all the combatant nations. 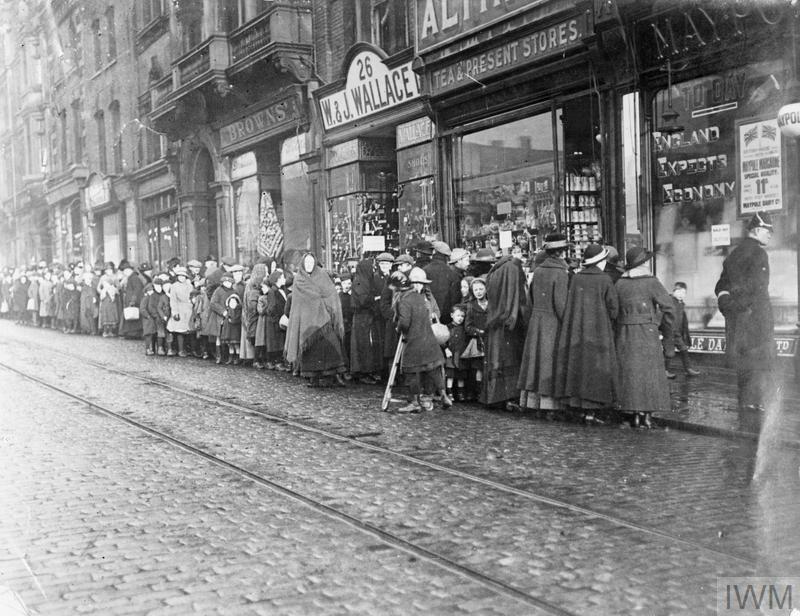 Agriculture and food distribution suffered from strains imposed by the war and naval blockades reduced food imports.